In medium bowl, mix flour, baking powder, baking soda and salt; set aside. In large bowl, beat softened butter and granulated sugar with electric mixer on medium speed until fluffy; scrape side of bowl. Beat in egg just until smooth. Beat in vanilla. On low speed, beat flour mixture into sugar mixture until well blended. Stir in 3/4 cup of the quartered gumdrops. Shape dough into 60 (1-inch) balls. Place 2 inches apart on ungreased cookie sheets; flatten each ball to 1 1/2-inch circle. 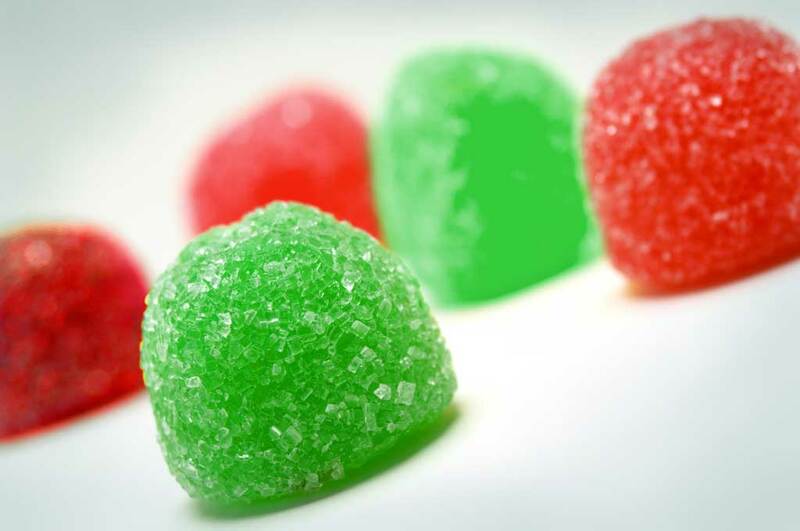 On each dough round, sprinkle sparkling sugar and place 3 quartered gumdrops. Bake 9 to 11 minutes or until edges are set and light brown. Cool 2 minutes; remove from cookie sheet to cooling rack. Cool completely, about 20 minutes. Store covered in airtight container.